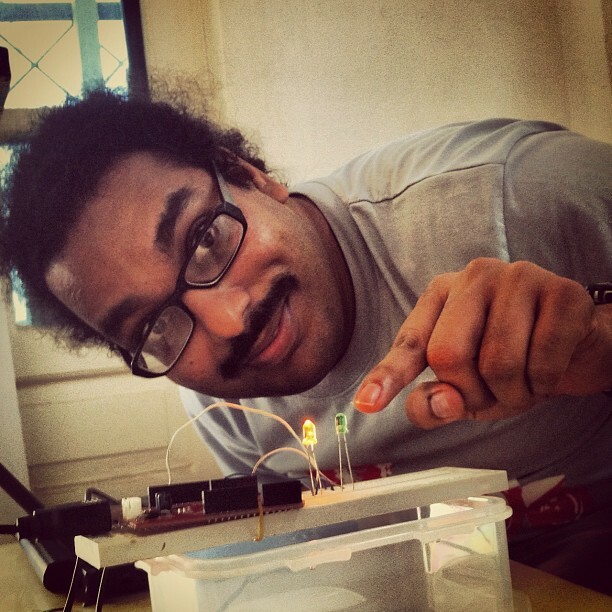 Spent the weekend learning basic electronics with Arudino open source prototyping platform. La 4uatrieme creative lab organized a two day Arduino workshop in Hanoi. Designer and teacher Eoin Kinsella delivered a very interactive workshop. We learnt basic electronics, Arduino hardware and software environment by tinkering examples from the popular Getting Started with Arduino book. We spent the day building simple prototypes with sensors, switches and LED's on solderless breadboard and programed it using Arduino development environment. The Arduino IDE on Linux is not well tested. During the workshop I found a minor bug in Arduino package in Ubuntu and fixed it right away. The inexpensive Arudino hardware makes it easy to build interaction design and physical computing prototypes. With 3D printing services such as Shapeways you can now bring your ideas to life much faster than ever. You can buy Arduino hardware in Vietnam from Soatec (www.sotatec.com) in Ho Chi Minh city. Lucky you. I don't have access to this Circuitco BeagleBone hardware. Love ARM hardware. This should get you started with Linux on ARM with BeagleBone.